The drive to find personal meaning or significance in impersonal or insignificant coincidences (Subjective validation) may be related to the powerful “natural” drive to create stories, narratives that string together bits and pieces of information into a tale. Of course, truth matters most of the time, but many of our narratives satisfy us regardless of their accuracy. This tendency to connect things and create plausible narratives out of partially fictious items is called Confabulation. In my book A Portrait of a Lifeartist (free download) Confabulation is a central issue. I here show how memories are constructed by all of us and that the construction is a mixture of fact and fiction. So, in our time with the spreading of subjectivism and relativism - and therefore Magical thinking - we are seeing how Confabulation somehow gets a justification. There is in fact - as I claim in my articles and books on The Matrix Conspiracy - a New World Order emerging: the world of Alternative History, Alternative Physics, Alternative Medicine and, ultimately, Alternative Reality. That my concept of The Matrix Conspiracy is correct, is today especially emphasized by the election of the new president of the United States, Donald Trump, and his government, who are defending concepts of “alternate truths” about Trump´s ideas, and “fake news” about any critique of him. This without much consequence, and without much protest from his many electors. Already now, another president, namely the Syrian president Assad, has found this inspiring and is saying that the allegations of torture and mass hangings in his country is the product of “a fake news era” (paradoxically enough, in the moment of writing, Trump has just ordered the missile attack on Assad). When fascistic, nazistic and communistic regimes took the power in the 1930s and 40s – often after an election where they did well – it happened with a combination of show, suppression and salami tactique, where layers of the opposition were peeled off one after one. The first, which leaders, who want to establish an authoritarian regime, go after, are the courts. They try to remove the judges, who might limit their exercise of power. And we have already in Trump´s style and rhetoric seen a high degree of hostility towards judges. As a presidential candidate, he declared, that a certain judge hadn´t the right to judge in a case against him, because he was of Mexican origination. As a president, he has referred to judges, whose verdicts were against him, as “so-called judges”. So, it is quite unusual for any American government official, not to speak of a president, to speak out so hostile about the courts. The next target is the parlementary gatherings, which formally are maintained, but are deprived the ability to put up limits for the executive power. A future tyrant can use terrorism as a tool to usurp power. This is relevant both in Europe and USA because terrorism – understandable enough in Europe´s case – takes so much attention. So far it hasn´t been a big problem in USA, but mentally it fills a lot in peoples´ consciousness. Modern tyrants need terror, they need a group, they can stigmatize, they need people who are afraid. Now we have an administration in USA, which talks about terrorism all the time, which associates muslims with terrorists and which could be reacting on terror-actions, when they occur, by suspending fundamental rights. And because Trump so openly admirers Putin and speaks of him as a “strong leader”, a man who is an expert in terror-management, who used the threat of Chechnya terror to build up an authoritanian rule and has done the state of emergency permanent. Another paramount element in a potential tyrant´s takeover is of course the fight for the opinion-forming. Trump´s permissiveness dealings with easily verifiable facts is wellknown and the medias are themselves full of debates about fake news and the post-factual society. What the debate lacks is an understanding of the connection between the doubt about facts and an authoritanian political development. There is a fundamental relationship between our opinions about what is truth, and the political risk of fascism, and it is important we understand it. The people who stand behind the Post-truth-industry – who, for example are responsible for the Russian medias – are fully aware that democracy is dependent on the rule of law, and the rule of law is dependent on trust. If you can make a large part of the population believe, that there are no truths, that all facts are uncertain, that everything are depending on the eye of the beholder, then the citizens have no basis criticizing the power, because you can´t formulate a critique without the existence of factuality. If we reach the complete post-factual level, the political society will be impossible, also the rule of law and the civil society. Then it will be the person who has the biggest megaphone or is the best to produce TV shown, who wins. Remember the management theorists´ slogan: It is not facts, but the best story that wins! The management theorists are leading Matrix Sophists. The people who stands behind the spread of fake news know all this. It is therefore they do it. So, when president Trump for example spread completely undocumented information about that Obama has ordered him monitored, then it is not only a lie he is caught in saying; it is part of the war against truth. And it is something he is doing all the time. It is a part of the destibilization of the nation´s whole way of communication. 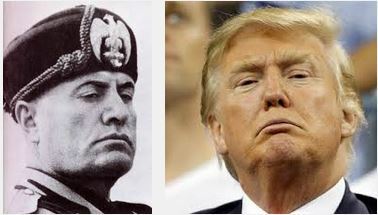 It is all manifested in Trump´s Mussolini-like facial expressions. Don´t ease up with an authoritarian rule´s wishes! Defend the institutions! Stand by your professional ethic! Take care of language! Believe that truth exists! Keep the head cold during terror attacks! Don´t get used to Swastikas and other symbols of hate! Guard your private informations! Be alert to para-military units! Be so brave as you can! Remember anti-authoritarian thinkers such as Hannah Arendt and George Orwell! They seem to have been forgotten. The name Newspeak is the name George Orwell gave the language, which the rulers in his dystopian novel 1984, had created. The intention with it is to control thinking, to make some ideas impossible to think, including concepts such as good and evil, true and false, beautiful and ugly. In this connection they are using concepts such as old-thinking and new-thinking, so that people get a feeling of guilt, everytime they use concepts within old-thinking. The rulers are doing this by connecting concepts within old-thinking with the word thought-crime. A long line of “old” words – which according to the ideals of positive thinking – are negative, are in our society systematical being replaced with new, more “positive” sounding words. The idea is that you through thoughts and language can eliminate negativity and suffering. Problems are being given “positive” names, whereby they either are being hidden, denied or simply not are being acknowledged as problems. ​In an article called The Power of Negative Thinking Burkeman is asking in a comment to the firewalker incident: What, exactly, did they expect would happen? In fact, there’s a simple secret to “firewalking”: coal is a poor conductor of heat to surrounding surfaces, including human flesh, so with quick, light steps, you’ll usually be fine. Moreover, the website contains the 24 wall paintings, 48 poems and extract of pieces of music. It is all divided in relation to the 24 chambers in this time capsule, and the meaning is that they shall have a transcendent effect and in this way be a portal to ”other” dimensions of reality. The seven time capsules are also called DNA triggers. Altogether genetics is a central concept on the website. The WingMakers Project is an attempt to create an alternate history. Alternative history or alternate history is a genre of fiction consisting of stories that are set in worlds in which history has diverged from the actual history of the world. Since the 1950s this type of fiction has to a large extent merged with science fictional tropes involving cross-time travel between alternate histories or psychic awareness of the existence of “our” universe by the people in another; or ordinary voyaging uptime (into the past) or downtime (into the future) that results in history splitting into two or more time-lines. As mentioned, in the last chamber in the cave system in the desert, was found an artifact from outer space; an optical disc presumably holding the information about the site´s creators and their purpose. And, as mentioned, after considerable effort to access the optical disc, the ACIO team finally succeeds, and determines the creators of the site as the WingMakers. And, I´m sure, out of this artificial artifact also stepped The Confabulation of Trump. In the Matrix Dictionary you can find updates and latest news on Donald Trump (click here).